There are a lot of reasons why many users will like Dell Latitude 10. Even if we ignore the additional equipment that can be bought separately (or are included with more powerful models), Latitude has much to offer. Even without the replaceable battery, Latitude has enough battery autonomy to stay turned on during a whole work day and enable business users reliable work when they need it. So can we recommend the Latitude 10? Yes, but with one key caveat - it is not a laptop replacement if you do intensive tasks of any sort. A workhorse PC it is not. We certainly wouldn't recommend its use on a desk as a PC replacement, but it is handy as a second desk screen for keeping an eye on social feeds or email. And it's handy in meetings, too. But when buying a tablet at this price point, there are still better options out there, such as the Microsoft Surface Pro. It's a full-blown Windows 8 tablet, too (albeit with Windows 8 Pro) but it features a Core i5 processor instead. That means it really is capable of being your main display (it does still only come with 32GB of storage, however). It is alot more expensive than the Latitude 10, but the investment is worth it. Windows 8 hasn't taken off as well as Microsoft would have liked, but six months on there's still a steady stream of products being rolled out with Redmond's latest OS. The best Windows 8 tablet to-date, this Latitude 10 from Dell offers incredible battery life, and decent performance. Price can stack up quickly if you plump for the many accessories, but it could be worth it. Add the stylus capability, which places it one step ahead of the Acer Iconia W510, and the desktop dock, which adds to its office-bound appeal, and you have (almost) the perfect mobile workhorse. The Dell Latitude 10 sets a high standard for Windows 8 business devices; we wonder if anything else will be able to compete with it. While it lacks the performance of a laptop or tablet using Intel Core chips, this model is perfectly adequate for productivity work and the kind of tasks that workers have been bringing tablets into the workplace for, especially with its impressive battery life for working while untethered from mains power. However, the biggest stumbling block to the Latitude's success is probably Windows 8 itself, although IT departments may be inclined to look more kindly on a device such as this than on the iPad or Android devices, as it can be managed using existing management tools. The Dell Latitude 10 seems to be a very viable alternative to Microsoft's Surface RT tablet with a similar pricing and features. The Intel Atom Z2760 CPU should prove to be a worthy competitor to the ARM CPU in the latter by performing better and also by consuming less battery power, making this a good device to be carried around. The overall performance is good, although there is some slowdown while extensively multitasking. The screen is bright and has a great response to finger touch. The stylus is a bonus input device. For Rs 1500 more, you can get a 4-cell battery that can literally double the battery backup. Add a docking station at Rs 10,000 and a keyboard for Rs 1500 and you raise the productivity of this device to a whole new level. Priced at Rs 36,000, this is the cheapest Windows 8 device we have reviewed, and its looks and build grant it good value for money, thus making it a good buy. Dell's first Windows 8 tablet is an Atom SoC soluton that's aimed primarily at business users thanks to a slew of security options, including TPM, biometrics, SmartCard and encryption software for local and USB drives. If battery power, maximum portability, legacy program compatibility, and IT mandates are keeping your business from rolling out tablets, then take a long hard look at the Dell Latitude 10. It can fulfill your traveling workers' need to stay on the corporate programs and servers, while giving them extreme mobility. It's more of a stay-in-touch and information-retrieval device than a multimedia workhorse, but if your workers are clamoring for tablets, and Mordac the Preventer is keeping Windows RT, iPads and Android tablets off your corporate network, then the Dell Latitude 10 is the one you want. If you want more power for multimedia and number crunching, then the Editors' Choice for Windows 8 slate tablets Microsoft Surface Windows 8 Pro is a better performance tablet, but its battery life is half that of the slim Latitude 10. As such, we award the Dell Latitude 10 with our first Editors' Choice for Business Windows 8 Slate Tablets for its IT-friendly features and true all-day battery life. The Latitude 10 we received for testing costs Rs 35,990. That’s a lot cheaper than most hybrid Ultrabooks and tablets that come with keyboard docks, and is even quite a bit cheaper than some of the Windows RT tablets in the market as well as the 64 GB fourth-gen iPad. A variant with 3G costs Rs 41,990, and both can be had with Windows 8 Pro instead of Windows 8 for Rs 3,800 more. The aforementioned desktop dock costs Rs 10,000. You can pay Rs 1,300 extra at the time of purchase for a 4-cell 60 WHr battery instead of the standard 2-cell 30 WHr unit, and if you want a secondary 60 Whr battery at any time, it will cost Rs 3,600. Dell Latitude 10 makes perfect sense for business users. But the tablet is also great for someone who wants a device for media consumption as well as to do work. We personally found this useful only in the desktop mode as the modern UI and the apps on Windows 8 are no match for the UI on Apple and Android tablets. The USB port makes things hassle-free. This is probably the only time that we did not bother using the micro-USB port on the tablet, as all copy-pasting work was done directly via the USB port. It is a boon for those who dread and downright hate the hurdles Apple iTunes makes you go through, or for that matter Windows Zune interface makes you go through. With the Latitude it is simple plug and play. Nothing can get any simpler. Positive: Solid build quality; high-capacity battery; Wacom active pen support; 3G modem and GPS module; dock. Negative: Performance; quite expensive. 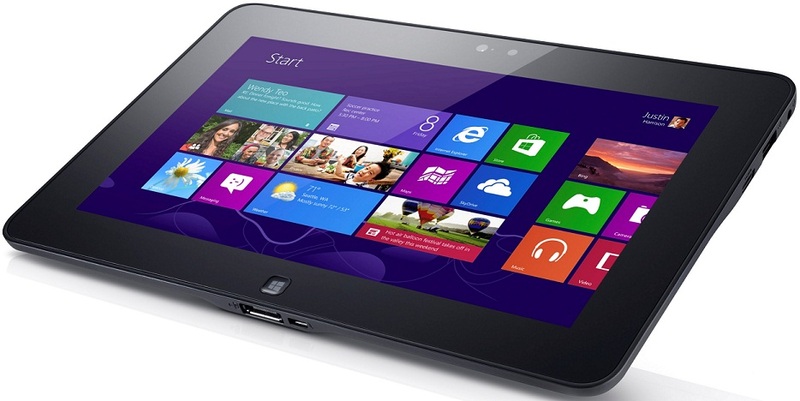 The Dell Latitude 10 features a full version of Windows 8, which appears to be the future for tablets. With a height of 16mm thick and a weight of 660 g, it might look futuristic. It is heavy compared to other similar devices, but it appears sturdy and has a great build quality. There is also room for extra ports. The design is once again practical. The black rubber around the back and sides make it comfortable to handle. One of the most practical features of all is the replaceable battery. The Latitude 10 achieve an unbelievably battery life of above 9 hours during light use and video playback with the standard battery. With the optional four-cell battery, it even increases to 19 hours in the same scenario! Unfortunately, the Latitude 10 does not have a high performance with is dual-core 1.8 GHz Intel Atom Z2760 processor. While Windows 8 runs smoothly enough, multitasking is slow and more demanding tasks are out of the question. But, it handles web browsing without problems and casual gamers will find it satisfactory as well. The touch screen is responsive and the amazing 10.1 inch IPS display with 1366 x 768 pixels resolution is a joy despite not being full HD. Wide viewing angles and rich, vibrant colors make it ideal for media consumption. Finally, the Latitude 10 is a great choice with good value for light users, especially with the full Windows 8 featured.